During my freshman year at Oberlin College, the co-chairman of the Consolidated Relief Fund steering committee was a junior from Kalamazoo named Roberta Dew. Thats Roberta on the right. The CRFs annual drive raised over $6,000 for charity that year. The next fall. Oberlins Senate Social Rules Committee proposed relaxing the hours when freshman women were allowed to be absent from their dorms. They proposed eliminating the rules entirely for the upper classes. On the first of October, 1966, the issue was debated at an open forum, and Roberta expressed the opinion of an old-fashioned girl. 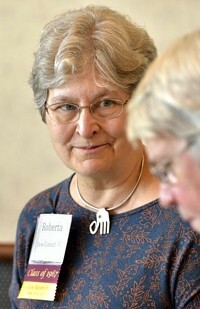 Majoring in psychology, Roberta graduated in 1967 and moved to Boston, where she obtained a degree in special education from Boston University. As Roberta Dew Conant, she earned a Psy.D. in 1992 from Massachusetts School of Professional Psychology, specializing in child and family therapy. Here she is at her 50-year Oberlin reunion. But Im getting ahead of myself. During my sophomore year at Oberlin College, I was enrolled in Sigrid Bauschingers second-year German course. 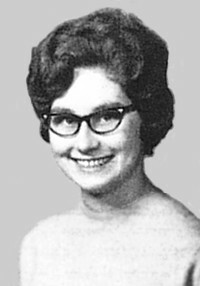 Most of my classmates were also sophomores, but (somewhat to my surprise) at least one was a senior  none other than Fräulein Dew. To broaden our perspective, we German students were encouraged to go to certain campus events which no one but us would have attended. One was a drama, enacted by German majors on the stage of the 500-seat Hall Auditorium before an audience of 50 seated in the front few rows. My knowledge of the language still wasnt good enough to understand more than part of the dialogue, so I remember nothing of the play. The other was a black-and-white German-language movie. As we gathered, a couple of my classmates actually used the language for a very brief elementary conversation. Wieviel Uhr ist es? Drei Viertel auf acht. (What time is it? Three quarters of eight, or 7:45.) I was impressed. Then the movie started. Although I think it was a rather recent film, it was set before the first World War. I perceived it as a critique of the Prussian bureaucracy and the ethos of the early 20th century, in which society expected proper young men to enlist for a term in the Kaisers army. I recall only a couple snippets of dialogue. More than once, a character was questioned, Haben Sie gedient? (Have you served?) And when he finally did sign up to serve in the military and was filling out the papers, he came to the blank that asked for the color of his eyes. He asked his friend, Augen? Augen! Was hab ich für Augen? (Eyes? Eyes! What have I for eyes?) For some reason, I found that amusing. I happened to be sitting next to Fräulein Dew and glanced at her knees. Unlike most Oberlin coeds, she was wearing hose, being properly dressed for the evening. When the movie ended, we walked out together discussing it. I remarked that watching the movie had reminded me somewhat of reading a Charles Dickens novel. In each case, the plot criticized certain evils of society, but fortunately those evils no longer exist. We have eliminated the squalid debtors prisons of Dickens day and the rigid cultural expectations of the Kaisers day. Thats a good point, Roberta agreed. I was proud of myself. I had actually made an intelligent observation. And I had actually expressed it to a senior, and an attractive one at that. Of course, I had failed to notice the parallels to my own day, in which the government expected proper young men to enlist for a term in Vietnam  or to submit to being drafted.